Thursday night the 7 Cardologists had a double celebration. It was our St Patty's party but also it was Bob's birthday. Tina made an excellent dessert - because Bob loves ice cream, and green is the color of the day - she made a peppermint ice cream brownie cake. Yum. Of course, in the rush I forgot to take a picture of Bob's birthday card. Hope she'll be kind and take one for me. Here is the card I made for St Patrick's day. I also want to enter it in Virginia's View Challenge this month for the watercoloring. I embossed gold shimmer cardstock with a Darice embossing folder, stamped and embossed a verse from My Sentiments Exactly on watercolor paper, and painted a rainbow. A scrap of green paper, a shamrock button from my collection and a piece of gold thread finished the card. May the leprechaun's be kind to you! Thanks for visiting. I really LOVE your card! 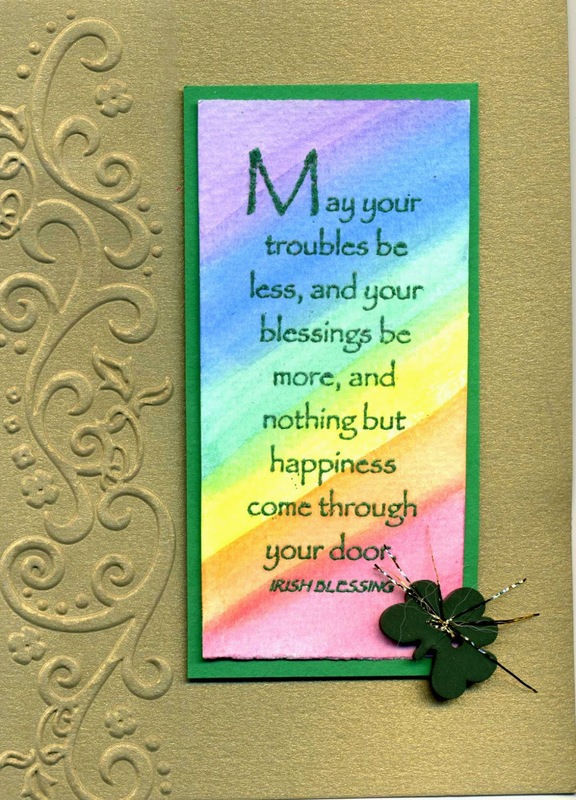 Not only the gorgeous rainbow colors, but also the shimmery cardstock you used, the embossed strip, the shamrock with the golden thread, the saying - everything! Fabulous water-colored background!! Love the sentiment and the shamrock embellishments! Thanks so much for joining the fun at the first Virginia's View Challenge!